Quick confession: since I live in Canada, nothing’s actually labelled as “5 gallons.” Also, the rumors you’ve heard about Canada are true – everything is in french. I’ve gone my entire life without ever having an opinion about trash cans until now. We purchased this fancy-pants 5 gallon garbage can (don’t ask me why) and 50 5 gallon garbage bags. And this is what happened. This isn’t the only problem we had with this 20$ can – which cost 20$ too much by the way. Since it’s wider on top than on bottom, every time we closed the door it fell over and spilled garbage all over the area underneath our sink. Thanks for that, Rubbermaid. Compare those frustrations with this 5 gallon bucket I picked up free from the Safeway deli. 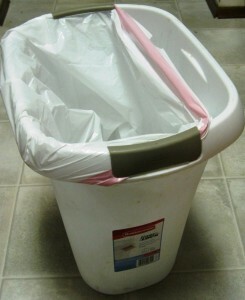 Wow, those 5 gallon trash bags actually fit this 5 gallon trash can! And it’s got such a solid base that it’s never tipped over, even when we fill it irresponsibly with heavy wet stuff in the top and light fluffy paper towels in the bottom. In fact it’s such a perfect shape for our bags that when we fill one up and tie it off, the full bag stands up by itself as it waits by the door for someone to take it out. And see the handle? Once you start using a trash can with a handle on it you’ll never want to go back. Instead of bringing the mess to our can, we now take our can to the mess. Update: Finding perfect 5 gallon trash bags is a little tricky. There aren’t any sized perfectly on Amazon. We got ours from Wal Mart, which is a store that is not hard to find. Five gallons buckets or water jugs are refered as “18 litres” in Quebec. 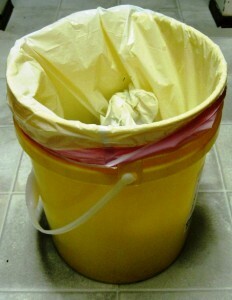 When converted, 5 US gallons equals to 18,927 litres, which is definitively not 21 litres as labelled on the trash can. Right you are! I’ve seen similar sized cans labelled 19, 20 and 21 liters. And many “5 gallon buckets” are actual 5 1/4 – even up as high as 6. Quick question: What are the measures of a flat 5 gallon plastic bag like you bought? It might be easier to find them labelled this way. It’s that first picture actually, which I probably should have framed better. 50 x 52 cm. re earlier post: oops, make that 9″ diameter x 18″ high. Hmmm well earlier post didn’t post!… I need a step-can liner that size (9″x18″) cylinder (not tapered) for compost, prefer plastic because existing galvanized has rotted out. Anybody know where I can find one? looked a lot online. Thanks! Can you please provide the brand of the bag in the 5 gallon bucket picture above? I’m looking for one with a drawstring, like the one pictured. In spite of my fairly advanced web searching skills, I’m unable to hone in on one. Thanks! It was a long time ago so I don’t remember. But I think it was from WalMart.